December 1, 2009 By Charlie Cutshaw & filed under All Articles, Rifles & Carbines, Weapons. FNH SCAR 16S is set up to accommodate not only optics, but also full spectrum of modern LE accessories, including Trijicon day optic, OSTI AN/PVS-22 night vision sight, 100-round C-Mag, and FABARM Speedlight combination vertical foregrip weapon light and folding bipod. The Special Operations community has been using the FNH USA SCAR (SOF Combat Assault Rifle) for several years. The carbine is now available to the general public in semiautomatic configuration (SCAR 16S). Let’s begin by pointing out that the “commercial” SCAR carries over all the features of the military version except the full-auto capability, and for most law enforcement and all civilian users, select-fire capability really isn’t necessary. Before I get into the evaluation of the latest version of the SCAR, however, a bit of history is in order. 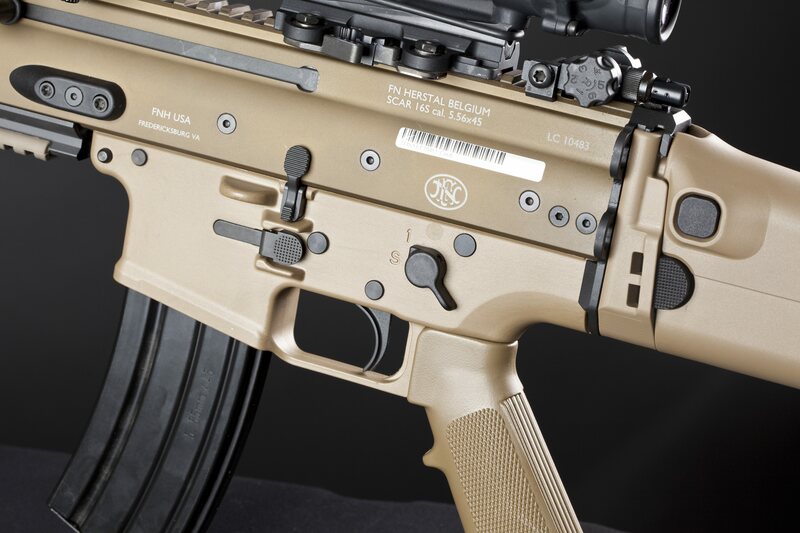 SCAR 16S receiver area shows ergonomic controls placed for easy access. The Special Operations Community has long had issues with the M4A1 Carbine. Lethality problems surfaced as long ago as 1993, when Delta Force soldiers repeatedly shot Somali gunmen only to have them continue to fight. But lethality wasn’t the only issue with the M4A1. According to a 2001 Special Operations Command study, changing the M16 to a short-barreled carbine configuration created a mechanism that approached or exceeded the limits of the weapon’s design and materials. SCAR 16S muzzle brake/ flash suppressor not only effectively reduces flash but also muzzle rise, enhancing control in rapid-fire situations. The study further states that all M16-derived carbines are “fundamentally flawed” for a variety of reasons. Shortening the gas tube resulted in, among other things, early timing in which the bolt was unlocked and moving to the rear while the cartridge case was still adhering to the chamber wall under residual pressure from the fired round. This caused failures to eject, separated case heads and other malfunctions. The M4A1 has been kept operational generally due to intensive maintenance by the Special Forces users. 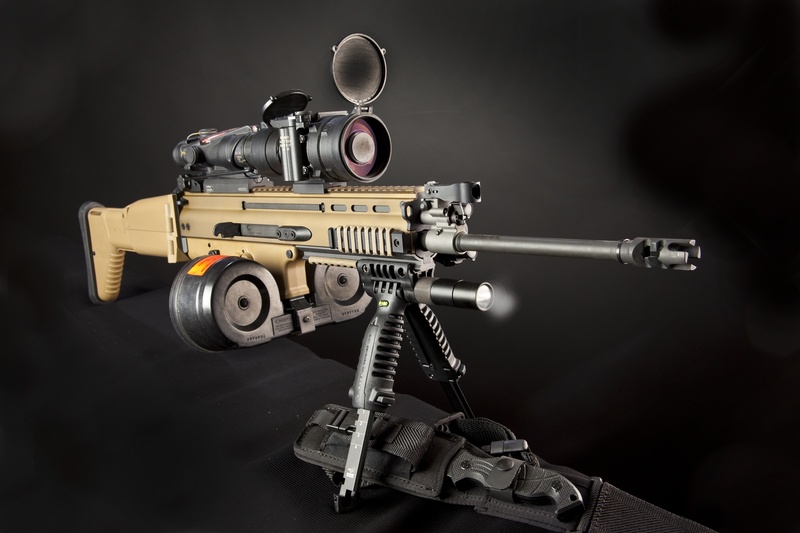 FABARM Speedlight vertical foregrip/weapon light also quickly converts to bipod. Not only are carbines much more numerous in Special Forces units, they are also used in ways that were never envisioned when the carbine was designed. By nature of their mission profiles, Special Operations users frequently have to lay down a heavy volume of fire to break contact with larger enemy forces, requiring full-automatic capability. This isn’t the case in civilian law enforcement, however, but is of particular concern to military users. In addition, the Special Operations Community added relatively heavy accessories to the carbine under the Special Operations Peculiar Modification (SOPMOD)/Modular Weapon System (MWS) Programs, which not only added weight, but reduced reliability. According to the study, M4A1 quality control also declined, further reducing reliability. Specific M4A1 deficiencies included problems in reliability, safety, accuracy and ergonomics. There are two military versions of the SCAR: the 5.56mm (.223) Mark 16 SCAR Light (SCAR-L) and the 7.62mm (.308) Mark 17 SCAR Heavy (SCAR-H). Both are essentially multi-caliber modular carbines with 90% parts interchangeability. The two SCAR variants replace five existing small arms systems in the U.S. Special Operations Community—the M4A1, the Close Quarters Battle Rifle (CQBR), the Mark 12 Special Purpose Rifle (SPR), the M14 and Mark 11 (SR-25). 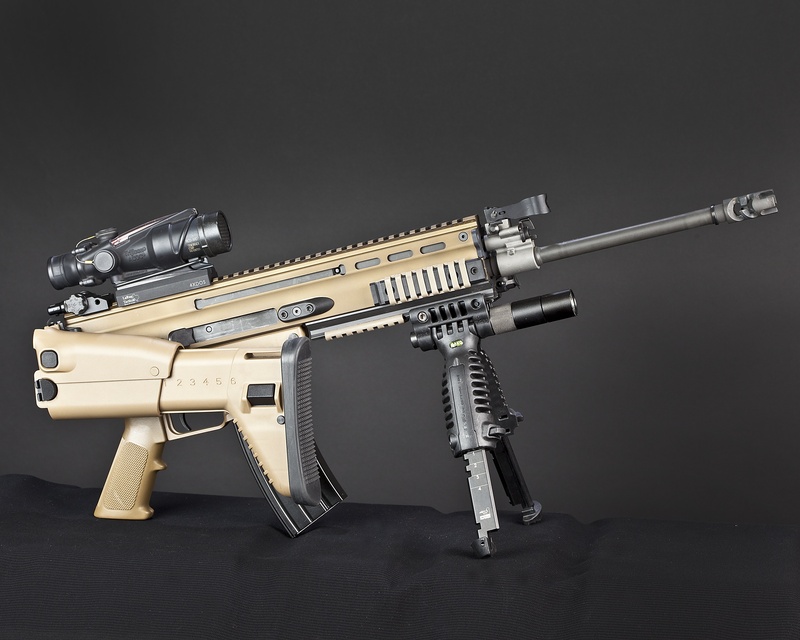 The SCAR was developed entirely using FN funding except for the government testing, and the SCAR-H was demonstrated six months ahead of schedule, saving tax dollars and enabling the new weapons to get to the troops who need them more expeditiously. 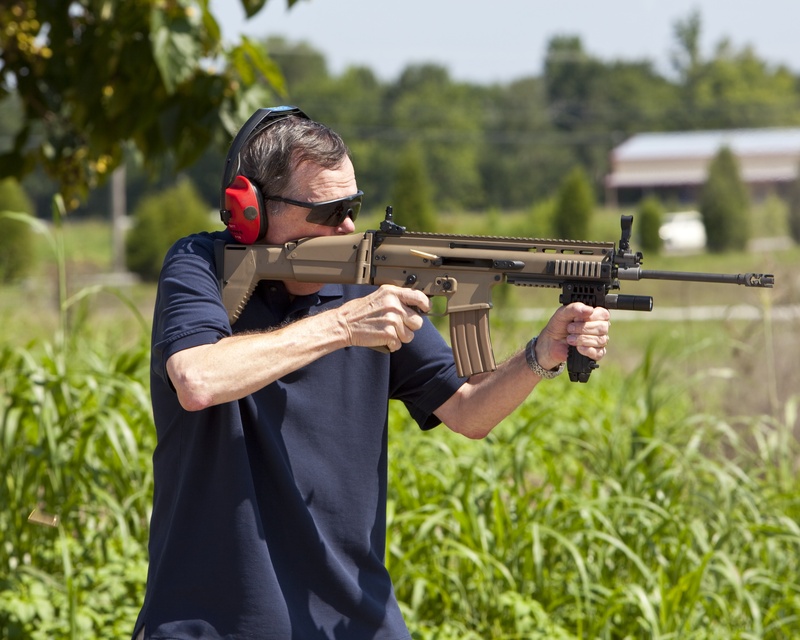 The SCAR carbines significantly improve on the overall performance of their predecessors. The SCAR stock both telescopes and folds. 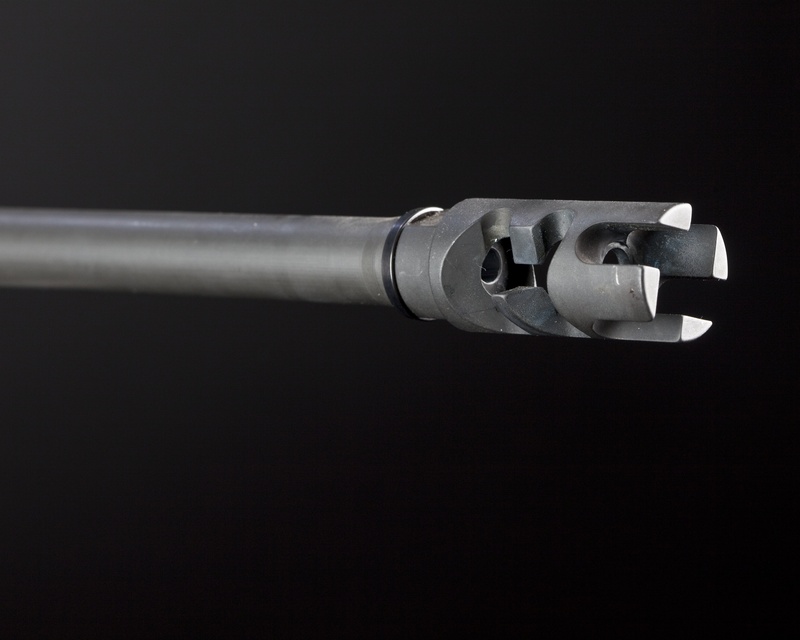 The telescoping feature is necessary for adapting the length of pull for different gear configurations, armor or clothing that may cause changes in the position of the carbine with respect to the distance between the user’s shoulder and trigger. SCAR 16S stock is adjustable for different lengths of pull and cheekrest height. The folding stock is a preferred option because many times Special Forces operators must be able to conceal their carbines under clothing and fire them with the stock folded. The folding stock also enhances operations from vehicles, helicopter insertions, parachute operations and other missions. The SCAR cheekpiece is sloped and adjustable so that the user has the capability to tailor the stock to his body’s anatomy and aid in obtaining the proper eye relief regardless of the optical sight mounted. The SCAR fire controls are optimized for easy engagement, and the selector switch is fully ambidextrous, as are the magazine release and bolt release, which are also fully ambidextrous and protected on both sides against inadvertent release. 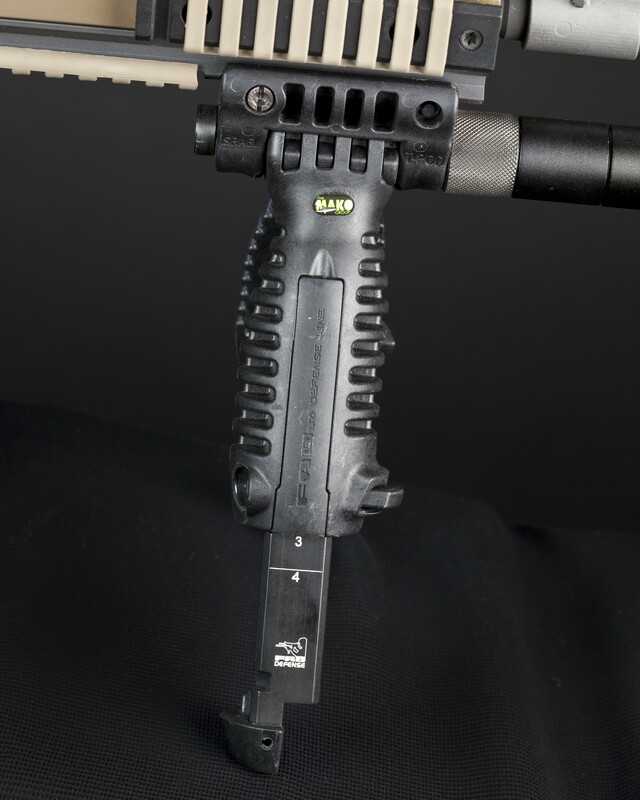 The charging handle also serves as a forward assist mechanism and backup bolt release. SCAR 16S stock folds to right for use in close quarters or vehicles. The SCAR tappet gas system is a departure from that of the M4A1 and resolves a problem that has plagued the AR family since its original design—fouling and particulate matter being blown directly back into the receiver and onto the bolt group. Not only does this make for a very “dirty” gun that requires fairly intensive maintenance but, with the wrong powder, excessive fouling can actually cause stoppages. The M16 rifle and M4 carbine get a blast of hot gases and fouling with every shot fired. Nearly as bad, the hot gases and fouling that are directed into the AR’s receiver cause the weapons to quickly heat up under rapid-fire conditions. The SCAR tappet impacts against the upper operating rod portion of the bolt carrier and drives it to the rear, unlocking the bolt via a cam. Excess gases and fouling are vented into the air. I fired nearly 100 rounds through the SCAR as fast as I could pull the trigger to see just how well the gun stood up to heavy use. The receiver never became hot, as would have been the case if I had been shooting an M4A1 or M16. Laser Devices DBAL-A2 is standard US military issue and combines laser pointer and illuminator in either visible or infrared (IR). In addition, the SCAR gas system is consistent regardless of barrel length, because the distance of the gas port from the receiver is the same. This makes the SCAR less susceptible to function problems with suppressors and different types of ammunition. The SCAR’s monolithic MIL-STD-1913 rail system provides an uninterrupted top surface for mounting optical sights and night vision optics such as the military standard AN/PVS-22 Universal Night Sight. The SCAR monolithic rail forend also free floats the barrel, a factor that enhances accuracy. The SCAR makes use of the most modern manufacturing techniques. The manufacturing process required a minimum investment in tooling and personnel training, since most processes are computer controlled. The unstressed upper receiver is an aluminum extrusion. The lower is likewise unstressed, lending itself to polymer construction. All stressed components are steel. Author sends rounds downrange during SCAR 16S testing. Carbine proved accurate and reliable. SCARs are finished in Flat Dark Earth, which is a good compromise color for deployment in most environments. There are very few straight lines and very little black in nature, so Special Forces personnel have been camouflaging their weapons with common spray paint for years. Sources within the Special Operations Community have mentioned that the military SCAR’s reliability is literally AK-like. SCAR barrel life is stated to be 35,000 rounds, and the service life of the overall system is stated to be 90,000 rounds. Of course, when and if barrels are worn out, they can be replaced in minutes by simply removing two bolts. Mean number of rounds between stoppages is 2,000 rounds. These are impressive figures by anyone’s standards, and for civilian use mean that the SCAR should last a lifetime. For the evaluation, I set up the SCAR 16S with Trijicon’s TA31RCOA4 4×32 Advanced Optical Combat Gunsight (ACOG), which is an improved version of the standard military TA31F issued for the Army’s SDM-R and carries the official Army designation AN/PVQ-31A Rifle Combat Optic. Since I was sent a full military version of the scope, I will use the AN/PVQ-31A (PVQ-31A) designation hereafter. What differentiates the PVQ-31A from the commercial version of the scope is the gear that accompanies it. 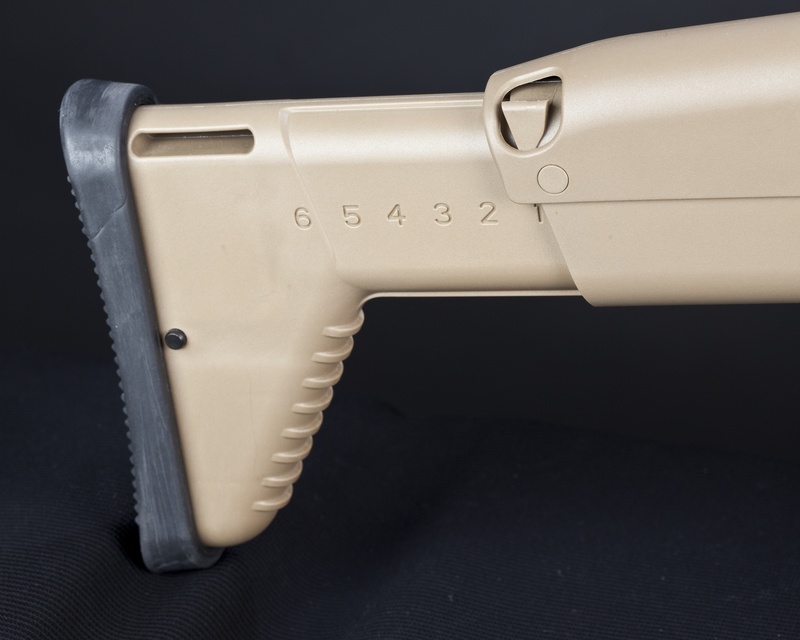 The PVQ-31A and B are both issued in a Desert Tan carrying case, with a LensPEN® for cleaning the optic and a KillFlash® antireflection device that prevents glint from the PVQ-31A lens from revealing the shooter’s position. The KillFlash is a honeycomb that fits over the scope’s objective lens and prevents glint from sunlight or any other light source from reflecting back off the lens and does not interfere with the shooter’s vision. 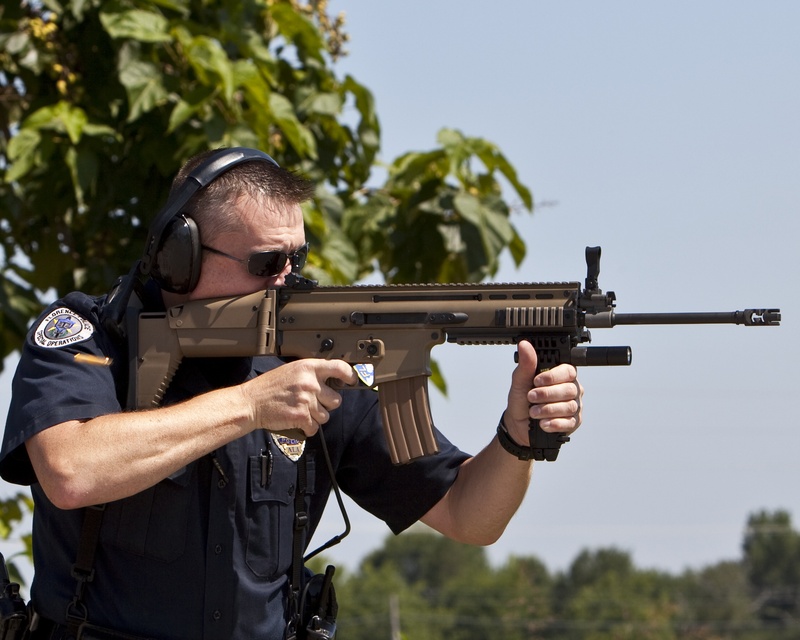 Florence, Alabama Police Officer Hal Howard test fires SCAR 16S. The PVQ-31A, like most Trijicon scopes, is capable of both day and night operations without batteries, thanks to an internal tritium source that illuminates the reticle without external power. The internal light source is guaranteed to illuminate the reticle for up to 15 years. The fiber optic atop the sight automatically adjusts the reticle brightness and contrast to available light conditions. The PVQ-31A reticle is set up for ranging out to 800 meters and is calibrated for the standard 5.56mm NATO (.223) cartridge. It also adds a horizontal reticle for windage. 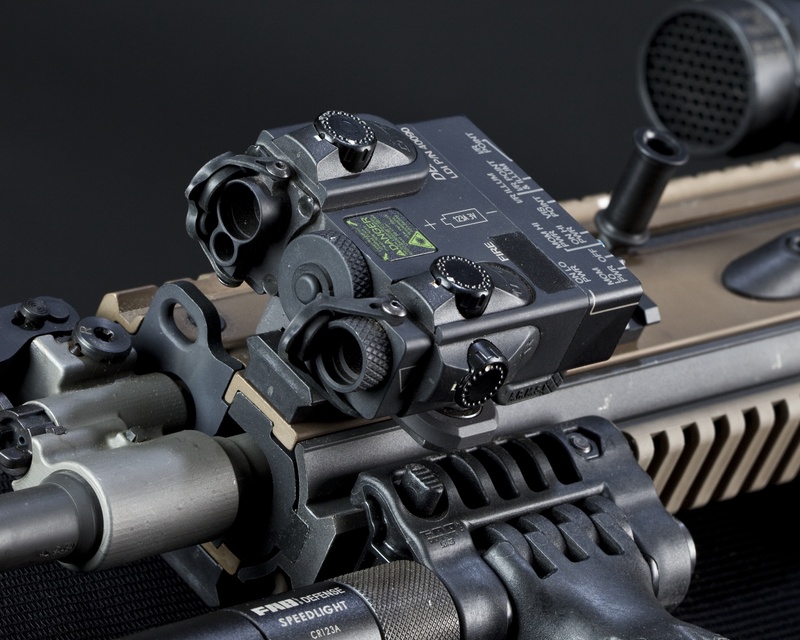 Like all ACOGs, the test scope uses what Trijicon refers to as the “Bindon Aiming Concept,” in which the scope has a relatively long eye relief of 1.5 inches, allowing the shooter to keep both eyes open to acquire and engage targets in very short order. The shooter acquires the target and shoulders his rifle, keeping both eyes open. With practice, the rifle is on target as soon as it reaches the shooter’s shoulder, with the tip of the inverted reticle essentially on target at ranges of 100 meters or less. At longer ranges, the shooter uses the vertical portion of the reticle for a precise hold for elevation and the horizontal reticle for windage. Having equipped the test rifle with optics, I set out to add a few of the latest items that I know of or have observed in photos from Afghanistan and Iraq. The first of these was Optical System Technologies’ AN/PVS-22 Universal Night Sight (UNS). The AN/PVS-22 is in such high demand from the military that the company is having difficulty keeping up with demand, and for good reason. Not only is the Gen III+ AN/PVS-22 the state of the art in image intensification (I²) technology, it mounts ahead of the day optic, eliminating the need for illuminated reticles and ocular adapters that cause eye relief issues. In addition, the AN/PVS-22 does not require an illuminated reticle. I have used night vision optics of all generations, beginning with Gen I back in my days in Vietnam up to the AN/PVS-14 and AN/PVS-17. The AN/PVS-22 is not only smaller and lighter than the PVS-17, but delivers a crystal clear image and works in conjunction with the rifle’s day optic, rather than having to be mounted in a standalone configuration. 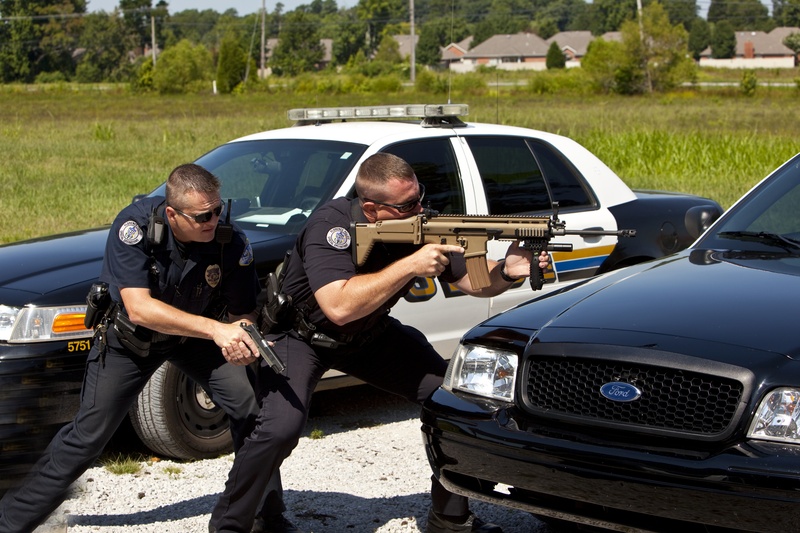 Florence, Alabama Police Sergeant Steven Robertson and Officer Hal Howard conduct emergency drills using SCAR 16S. Although a bit larger and heavier than the AN/PVS-14, the PVS-22 makes up for its slightly larger size by mounting ahead of the day optic rather than behind it like the PVS-14 and by its much improved image quality. As if this weren’t enough, the PVS-22 retains boresight throughout its focus range, has no beam splitters to go out of alignment, and has no parallax issues, even if mounted slightly off axis in relation to the day optic. I also installed one of Laser Devices’ latest Dual Beam Aiming Laser—Advanced² (DBAL-A²), known in its Army designation as the Multi-Functioning Aiming Laser System (MFAL, NSN: 5855-01-535-6166). Whatever it is called, this device is the military’s most recent laser aiming and illuminating device. The DBAL-A² provides an IR pointer, IR Illuminator, and red visible laser pointer and probably will completely replace the larger and less capable AN/PEQ-2. Modes are selected using a rotary switch to select between the visible laser and the various IR modes, including IR pointer only, IR illuminator only, or both. A low power engagement mode reduces the IR output for indoor use and CQB. Optical glass generators project different illumination patterns that include circle, square, triangle, plus sign or “T” for target designation and pointing. When used with the AN/PVS-22, the DBAL-A² enables the shooter to illuminate his target with a laser that is invisible to the naked eye—a major advantage in night operations. Windage and elevation are adjustable in 0.4 milliradian increments. The DBAL-A² is provided with optional mounts for MIL-STD-1913 rails—either a thumbscrew or ARMS throw lever mount. Since this is essentially a civilian version of a military rifle, we did not follow our usual practice with regard to ammunition, but selected only two—Black Hills and Hornady TAP. The Black Hills ammo is the company’s 77-grain Match round that is identical to the Mark 262 Mod 0 cartridge that it manufactures for military Special Operations users. The 75-grain Hornady TAP is the choice of many law enforcement tactical teams. Both have similar ballistics and are well suited for the SCAR user, especially given the carbine’s 1:7 inch twist rate that isn’t suitable for lighter weight bullets. Both deliver excellent accuracy as evidenced by Table 1. Shooting the SCAR was all that we expected. The two-stage trigger was all that anyone could ask: take-up was butter smooth and the trigger broke at approximately seven pounds with no creep. Ejection was positive and consistent, with all cases thrown about three feet to the right and slightly to the rear. For law enforcement or civilian self-defense use, FNH USA’s latest offering is a good, albeit expensive, alternative to carbines with similar capabilities. Controls are placed for easy access and are fully ambidextrous, with the exception of the left-hand charging handle, which reciprocates with the bolt carrier, necessitating that the SCAR shooter be conscious of where his left hand is placed. The adjustable stock and cheekrest should be adaptable to just about any size shooter, and when in the “up” position, the cheekrest places the shooter’s eye in just about perfect alignment with the optic. The only downside to the FNH USA SCAR 16S is its cost, with a suggested retail of $2,994. Our testing proved it to be reliable, accurate and controllable under all conditions.